The pressure to resolve to start doing something or stop doing something during these first few weeks of January is immense. It’s like gratitude is reserved for December, and change is reserved for January. I don’t buy into this. I see the notion of resolution — of reflecting and tweaking and reflecting and tweaking — as an ongoing effort, not a one-time event. It’s a constant process of thinking about what we want to invite into our lives and what we want to minimize. The idea behind this is to minimize the things that make you feel crummy and maximize the things that make you feel great. The items don’t need to be absolutes. For example, I have “less sugar” on my list. This doesn’t mean I’ll never ever eat sugar again, but it does mean I’ll be thoughtful every single day about how much of it I put into my body. This list is about living life on purpose – as much of the time as possible. What would you like to do more or less of during the year ahead? Green bean photo by tony.bailey, via Flickr Creative Commons. Love this…a positive, mindful approach, rather than a guilt-inducing “all or nothing” dictat! Great post Brynn! 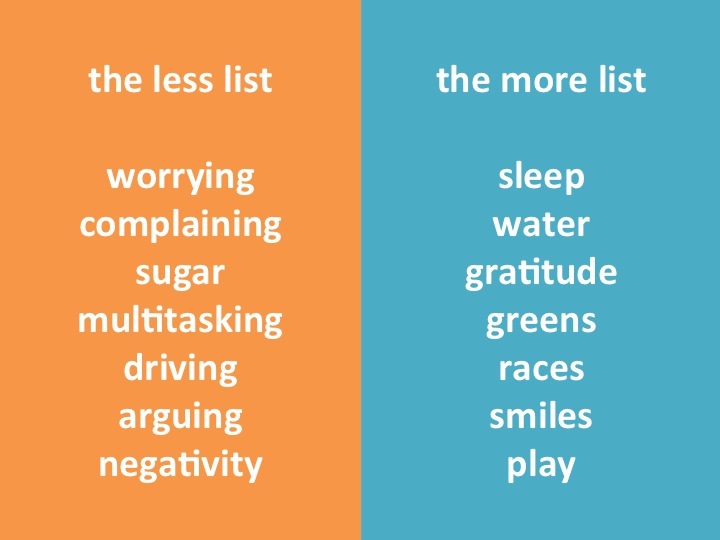 It made me smile as I had done the exact list (obviously the content is different) over New Years! This is great Brynn….do you mind if I use this for my fitness classes??? It is just AWESOME! Rebecca – I would be thrilled if you shared this. Thanks for checking. Be well!